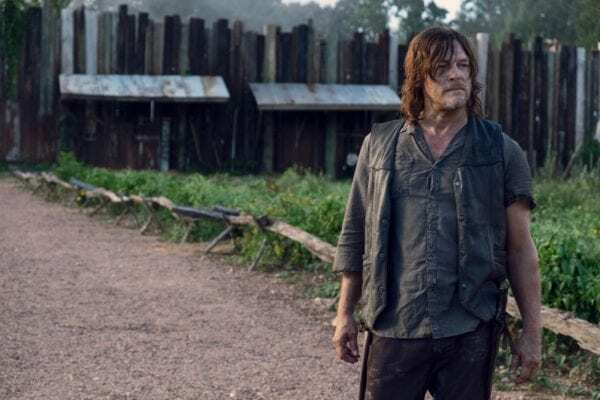 The Walking Dead Season 9 Episode 11 'Bounty' Review – AiPT! Alpha establishes herself as a truly unique and chilling villain while Ezekiel and Carol give us a rare enjoyable B story. Last week, Alpha showed up at Hilltop’s gates asking for her daughter Lydia to be returned. This week, we get to see how those negotiations go–and we get a B story that is actually good! The episode opens with a flashback to a simpler time when Jesus was still alive and Tara wasn’t slowly winning me over. She meets up with Ezekiel and Jerry, who is giddily sharing the news with his king that he is about to be a father. We also learn that Tara is disgusted with Michonne over the unexplained conflict that happened during the time jump and wants to come to the Hilltop. Tara also managed to sneak out the charter that all the group leaders had been working on before Michonne decided to peace out everybody. Ezekiel holds it with a reverent care that he still has for the document in the present. In the years since first acquiring the charter, Jerry has had multiple kids and the Kingdom’s projector bulb has burned out, effectively ending movie nights for everyone. This gives Ezekile and Jerry (and a begrudgingly agreeable Carol) the idea to break into an old, walker infested movie theater and get a new one. The plan starts off great. They utilize Eddie Harris’ ‘All Right Now‘ to lure most of the walkers away, allowing them access to the theater (and giving us an amazing display of Jerry’s lip synching skills). It also turned out that Ezekiel’s side mission had another side mission: Snagging a movie poster frame to frame the charter in for the upcoming fair. Carol throws cold water on his optimism, reminding Ezekiel that things are so dire for The Kingdom right now that they may want to consider leaving as a community for The Hilltop. Unfortunately, things go sideways when Jerry and Diane are attacked by a ninja walker, causing Jerry to drop the bubble-wrapped bulb into the main theater, where a bunch of zombies (likely waiting for the next Adam Sandler/Kevin James comedy) are still stuck inside. Just as Ezekiel is about to give up, Carol decides to go full on “queen” and declares that they can easily take out those walkers and get the bulb back, which they do. Compared to the main plot of the episode (which we’ll get to in a second), this story felt kind of pointless. But in addition to being a lot of fun, it also helped establish a bit more solid framework for just how estranged Alexandria was from the other communities while also helping remind us why it’s so easy to root for The Kingdom (and why Ezekiel and Carol are a pretty great couple after all). And who wouldn’t give their life for movie nights? Now we come to the main course–and as you probably guessed (or saw in the trailers), Daryl was not too keen on giving Lydia back to her abusive mother. To Alpha’s credit, she makes a solid argument for why they should give her her daughter back: Not only will it avoid conflict, but The Whisperers will return Luke and Alden, making it a two-for-one deal. When Daryl tries to say that they can just shoot all The Whisperers to death, Alpha reveals that one of her company is carrying a baby. She then make a speech about how they’re “animals” and “animals have babies,” although she left out the part where animals don’t normally make sociopathic schemes that involving using babies from their pack as shields. Daryl is swayed by Alpha’s craziness and decides to give Lydia up. Unfortunately, Henry (who has accomplished the incredible feat of making Carl seem both smart and less annoying) had somehow gotten wind of this took Lydia away from her cell. Thankfully, Henry used to sweat Adeline a bit, which meant she knew where he was hiding Lydia (?). Meanwhile, the baby that Alpha basically used as a human is not Judith, which means she cries–which attracts walkers. Alpha tells Beta and the others to go full Weekend at Bernie’s and draw the walkers away from Alden/Luke, but can only offer the baby’s mother a cold shrug. Good lord this woman is psycho. Unbeknownst to the Whisperers, Connie has been hiding out in the corn this whole time and getting sign language signals from Luke. She darts out and swoops the baby into her arms before returning to the cornfield. At this point, the show’s sound goes muffled to the point of being almost completely muted, putting the viewer in the perspective of Connie as a deaf person trying to run from walkers and Whisperers through an already terrifying horror movie location trope…and it’s kind of awesome. What’s not awesome is that Daryl somehow knew exactly when to show up and save Connie and the baby, but I’m still glad he did. Daryl, Enid, and Adeline find Henry and Lydia and reveal that she will be given back over to her mother right as she’s trying on normal clothes for the first time in a decade (rude). Henry protests, but Lydia says it’s the right thing to do and gives him a kiss goodbye. The exchange goes smoothly except for Alpha smacking the crap out of Lydia before hugging her and demanding that she always call her “Alpha” instead of mom. Later, Henry asks Daryl how he could do that knowing that Lydia would be going back to a life of abuse. He explained that sometimes you just have to live with the bad parts of tough decisions you make to survive. Ever the idiotic idealist, Henry decides he can’t live with this one and goes out at night looking for her, ensuring that he and probably anyone who goes looking for him stands a good chance of getting killed. Daryl finds his goodbye letter and goes after him. Despite his protests, Connie decides to go with him, too. Oh, and Tammy and Earl get to keep the baby, so that’s nice I guess. As much as I love Negan, it’s nice getting a new villain who is truly unique from the others. Alpha sees herself and her Whisperers as animals and nothing more–although he’s still enough of a megalomaniac to break her own rules about not having attachments when she decides to try and retrieve her daughter. In addition to doing a great job establishing Alpha as a chilling character, ‘Bounty’ also gives us some really cool moments (like the cornfield chase) along with the aforementioned good B story. About my only issue is the part where Daryl somehow goes out to the corn field to save Connie and baby in the middle of all the craziness occurring around him. Also, there is a LOT that happened during the time jump that we didn’t know about–like Enid and Alden hooking up. Ew. Doesn’t she know he used to be a savior? But I digress…this was yet another excellent episode for a series that as of last year seemed to be going downhill. If we get one more great episode next week, I might even be willing to call this one of my favorite shows again. Much as I hate to admit this (because I am still Team Daryl/Carol), Ezekiel and Carl do make a pretty great couple. The episode had lots of great moments, particularly the chase through the cornfield done from the perspective of how little Connie would be able to hear around her. Alpha has been established as a truly terrifying and unique villain. Did Daryl learn ninja teleporting moves from the show's zombies? A lot happened during the time job that we are getting told about, but don't (and possibly never) get to see.